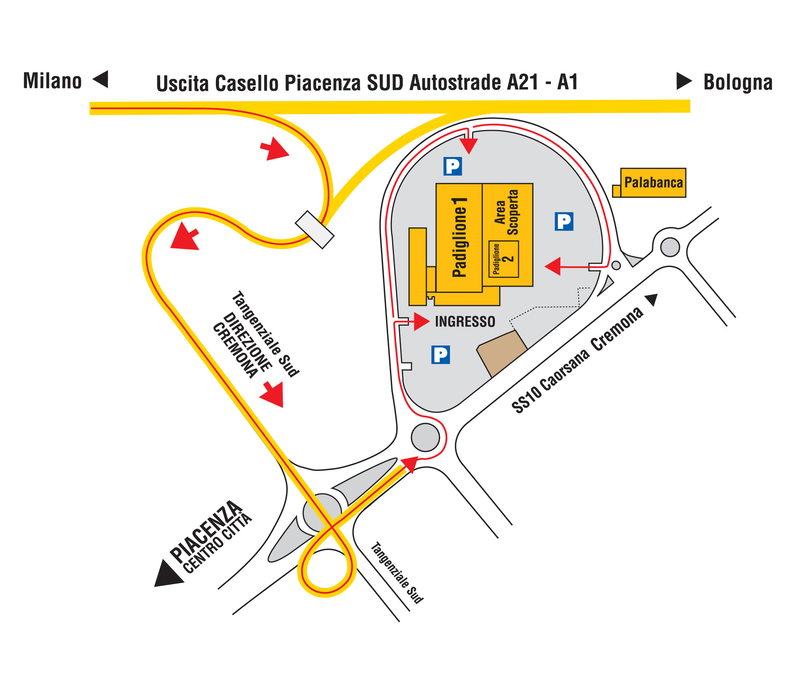 The Exhibition Centre stands just in sight of Piacenza Sud tollgate, in a context of road, motorway and railway junctions in the centre of North of Italy. Three airports (Milan Linate, Parma and Brescia) are a few dozen kilometres far from Piacenza, while five other airports (Milan Malpensa, Verona, Bologna, Genova and Torino) are reachable in about one hour. In addition to this, a logistic and transport system in the forefront makes Piacenza a thorough crossroads to Europe and its new exhibition centre a strategical meeting point for operators and visitors, susceptible of further developments. During the main exhibitions there is a free shuttle service from the railway station to the exhibition centre. Animals allowed on leash, except during agri-food exhibitions when they are not allowed.